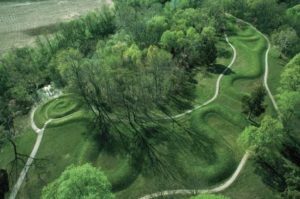 The many Native American mounds of Ohio have fascinated and mystified people for hundreds of years. Dr. Bradley Lepper acknowledged that many of these “large earthen monuments were oriented to pivotal points on the horizon. It comes as no surprise that these people were careful observers of sun, moon, and stars.” Many researchers have identified definite solar and lunar alignments on several of the Mounds. But the lunar alignments seemed purely astronomical and had no practical function. I became interested in Serpent mound in Adams county Ohio, and wanted to explore those alignments from a women’s perspective, since women have a very practical relationship with the moon. When I first met my astronomer friend David Chandler I found that he was able to calculate astronomical events, so I asked him to collaborate on this project. 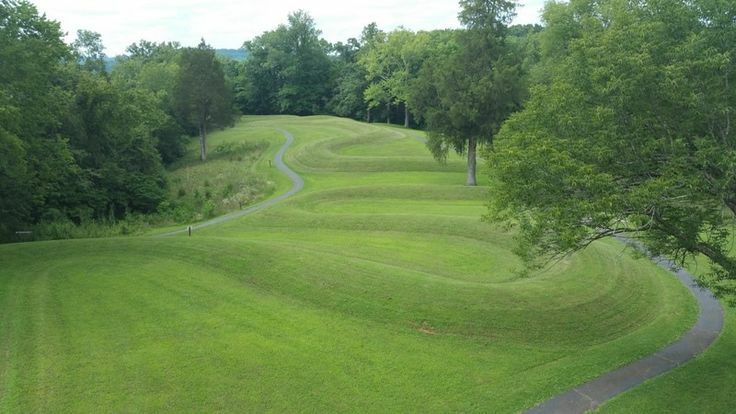 Today if someone visits Serpent Mound, it looks like a beautiful expanse of rolling grassy hills that would rival any well groomed English Park. But upon closer inspection it is a 3 foot high and quarter mile long mound that was constructed in the shape of a serpent. Native Americans know him as the Great Horned Serpent. Many say that the open mouth on the head appears to be swallowing an egg. Originally there were two smaller mounds on either side near the base of the head. During reconstruction they were missed, but they can still be seen in topographical maps. The body has three undulating coils that ends in a spiraling tail. Native American professor, anthropologist Dr. Barbara Alice Mann, says that the Great Horned Serpent is the male symbol of the Earth. Stories tell of the Serpent as a lusty and “horny” spirit that loved women. He was even bold enough to break cultural taboos when he approached a beautiful young girl in the mist of her menses. Other stories have Him closely connected with pregnant women. Dr. Mann says that the oval near his head is not an egg but a medicine pouch which he carries in his mouth that is flung over his horns, which are represented by the two smaller mounds. Modern Archaeologists attribute the mound to the Adena People, although some argue the Serpent is much older. Whoever they were said to be great astronomers, and this Serpent, that lies on the top of a ridge in a somewhat secluded spot, overlooking Brush Creek, in Adams County, Ohio, appears to be a perfect place for an observatory.